An abbreviated version of this page appeared as an article by Mark Whittaker in the July 2001 issue of the Community News, in our regular feature "Local History & Heritage with the Marple Website"
Once again, the article was presented as a double page spread without any editing or mistakes and all the pictures we provided were included. This page includes a couple of extra pictures that were not submitted to the paper. who died September 18th 1828, aged 72"
"He was the zealous promoter of every useful and benevolent measure calculated to aid the progress of general civilisation and local improvement, to encourage the pursuits of honest industry, to increase the comforts, amend the morals, and enlarge the happiness of the people among whom he dwelt. Animated with the most dutiful attachment to his King and a rooted veneration for our glorious constitution in church and state, he remained firm and unchanged in his principles under every political vicissitude. And when his country was threatened with invasion by a foreign foe, he held a distinguished command among those who voluntarily armed themselves in defence of their native land. Nor let this monument fail to record that to his unwearied exertions and generous munificence the inhabitants of this chapelry are chiefly indebted for the erection of this sacred edifice. A blessing which he rendered still more valuable by the influence of his example in constantly attending both the morning and evening services of Divine worship on every Sabbath day." Samuel Oldknow's family originated in Nottingham, where his grandfather had established a successful drapery business. 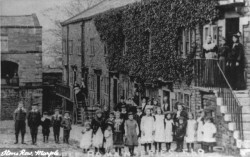 Oldknow's father, also called Samuel, moved to Anderton in Lancashire to study as a textile manufacturer and became settled there when he married a local girl, Margaret Foster. Sadly, Samuel Snr. died at the early age of 25. During a brief 5 years of marriage he and Margaret had three children, "our" Samuel, born in 1756, followed by Thomas and Elizabeth. The widow Margaret later married for the second time to a farmer, John Clayton. They had three more children, Margery, confusingly another Samuel and John. Details of Oldknow's childhood and early education are not clear, although it is known that he was apprenticed to his Uncle Thomas in Nottingham at an early age. By 1781, when he was 25, Oldknow had entered into partnership with Thomas and the following year he returned to Anderton, expanding into the manufacture of cotton goods. Oldknow quickly became a leading manufacturer of the finest quality cotton calico and muslin, goods which had previously only been produced by textile workers in India and imported into the country. Oldknow's fabrics were soon in great demand, particularly in fashionable London, where he developed a mutually beneficial business relationship and friendship with the merchant Samuel Salte. Much of their correspondence, along with many other documents, was discovered in a derelict coach house on the site of Oldknow's Mellor Mill in 1921. A discovery which resulted in the extensive work by George Unwin, "Samuel Oldknow and the Arkrights". In 1784, after obtaining a loan of �000 from Richard Arkright, Oldknow joined the great cotton boom in Stockport and purchased a house, warehouse and land on Upper Hillgate belonging to Giles Walmsley. The house, built around 1740, still remains today and is now used as offices. Leaving a manager in charge at Anderton, Oldknow quickly turned his Stockport enterprise into a huge success with 100 weavers working for him in the first year. Within two years he had become the foremost muslin manufacturer in Britain with the output from 300 skilled weavers using 500 looms at Stockport and 159 weavers at Anderton. This period represented the peak of Oldknow's financial success, with profits reported to be �,000 for each year in 1786 and 1787, a remarkable achievement for a man only 30 years of age who had set up in business just four years earlier. These years of great success and huge profit enabled Oldknow to implement ambitious plans for expansion, which included making Stockport the organising centre for the manufacture of muslins and calicoes. It would employ 1,000 weavers within a five- to six-mile radius and a further 1,000 other workers in related jobs. A new mill erected on the land at Hillgate was completed in 1790, this included the first Boulton and Watt steam engine for turning the winding machine. It is said that stagecoach drivers would slow their vehicles as they passed along Hillgate, so that they could tell their passengers about it. In 1787 Oldknow began to acquire a number of adjoining estates in Marple and Mellor, including the Bottoms Hall Estate and the water rights of the River Goyt. The construction of Mellor Mill, which commenced in 1790, was a massive undertaking. In addition to the construction of the mill itself, an imposing and handsome brick structure six storeys high and 400 feet long, the River Goyt had to be diverted, a series of three millponds constructed and a complicated system of tunnels, channels and wheelpits built. The millponds still remain and are today known as "Roman Lakes", a name they were given in Victorian times when they became a huge tourist attraction. Of the mill, destroyed by fire in 1892 and the ruins later demolished, there is no trace above ground. The central wheelpit that housed the 22 feet diameter "Wellington Wheel", another added in 1815 to house the "Waterloo Wheel" and their adjoining tunnels remain below ground, giving a faint and ghostly hint of the majestic structure long gone. Although several photographs and prints of the mill do exist, the best way to gain a feel for the scale of Oldknow's work at Mellor is to view the superb model constructed by Tom Oldham for the Oldknow Bi-Centenary celebrations in 1990 and now displayed in the Heritage section of the Marple Library. In 1792, a year before Mellor Mill came into production and only a year after spinning had commenced at the new mill in Stockport, there was a national economic crisis. This lead to a dramatic decline in Oldknow's trade and by 1793 it had virtually dried up altogether. Already stretched by the purchase of land and the construction of his mills, the crisis placed a huge drain on Oldknow's resources. Forced to contract his business empire, Oldknow was nevertheless determined to retain his interests at Mellor. Aided by a loan of �,000 from Richard Arkwright Jr. and after disposing of the works at Stockport and Anderton he was able to achieve this. These financial problems do not seem to have interfered with Oldknow's lifestyle, or deterred him from continuing with many ambitious schemes at Marple and Mellor. Whilst his attention was first focused on the mill and his estates at Mellor, he soon became involved in several other local developments. This was the age of canal building and Oldknow realised the benefits that a link with Manchester and the surrounding areas would provide. He was the principal promoter of the Peak Forest Canal and became chairman of the committee which financed and directed its construction. A prime reason for building the canal was the transportation of limestone from the Derbyshire quarries; Oldknow further turned this to his benefit by constructing lime kilns alongside the canal basin at Marple. Oldknow's numerous enterprises made an enormous demand for labour which could not be met by the local population and led to a steady influx of immigrants into the area. In order to provide housing for these people Oldknow constructed new homes at Stone Row and Brick Row in Marple and Red Row in Mellor. These people also needed supplies of food, coal and many other household requirements. All of this was organised by Oldknow, including the necessary improvements to roads and bridges on the transport route to Stockport. At Stone Row a market building was also constructed but Oldknow was unable to obtain a licence to operate, probably due to resistance from Stockport Market, and this was eventually used for further housing. Despite this, much of the produce necessary to feed the growing population was provided by tenant farmers on Oldknow's Mellor Estate. In common with many other manufacturers of that time Oldknow often suffered from a shortage of currency with which to pay his workers. A large quantity of small coins would be needed and with no local bank to supply them, even a profitable business could struggle to pay its workers' wages. Oldknow had an arrangement with a firm of bankers at Derby to supply �0 in cash every fortnight but records show that they were often unable to do this. This scarcity of coins was overcome by the issuing of notes which could be used to purchase goods from local shopkeepers. Known as "truck" this system was often used by unscrupulous employers to exploit their workers but Oldknow's enlightened and benevolent approach ensured that his workforce remained happy and contented. Despite increasing reliance on the financial support of Richard Arkwright Jr. Oldknow continued to live the life of a gentleman and was heavily involved in all aspects of the local community. 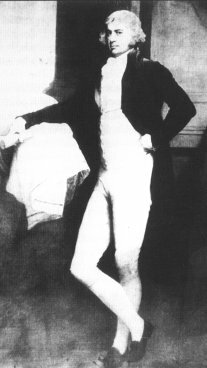 He remained a bachelor throughout his life, although he did come close to marriage on at least two occasions. The first of these was with the daughter of Mr. Peter Drinkwater, a Manchester textile manufacturer, to whom he was engaged to be married. It was the decline of Oldknow's finances which led to this being broken off. Later, local tradition has it that he formed a strong attachment to his neighbour, a Miss Shaw. She unfortunately suffered from ill health and it is thought that this prevented Oldknow from pursuing matters beyond friendship. Oldknow was a religious man and a regular worshipper at the Church of All Saints' Parish. In 1803 the old Chapel, by then over two hundred years old, was in a ruinous and dangerous condition. This decay was not due to lack of maintenance but old age; even the foundations had given way. Oldknow took the major responsibility in finding the money to fund the new Georgian Chapel and oversaw the building work, which commenced in 1808. 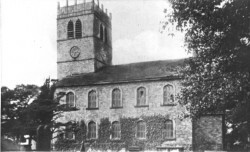 The building was completed in 1811 but improvements continued and in 1816 the peal of bells was delivered from St. Mary's Church, in Stockport. Later, in 1826, Oldknow donated the land upon which the Vicarage was built. The mill apprentices attended the Church on Sunday mornings and evenings and a private path to shorten their walk was made for them. It is said that Oldknow would almost always accompany them. The height of Oldknow's social ascendancy was in 1824 when he was appointed High Sheriff of Derbyshire. "The splendid pageantry of his departure from Mellor Lodge to the Derby Assizes" was described in the 26th March 1824 edition of the Stockport Advertiser. 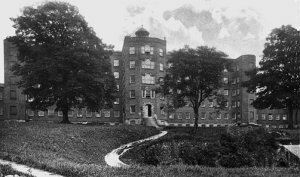 "He became an extensive landed proprietor both in that place [Mellor] and in the adjoining township of Marple; and a great practical and experimental agriculturist. As a landlord he was kind and indulgent, and that tenant must have been a hopeless character indeed whom he distressed. As an agriculturist he was surpassed by none for care and judgement in the selection of stock, or for the zeal with which he improved the soil and surface of his land, which was naturally sterile. He thought it patriotism to convert one blade of grass into two; and so well were his labours approved that he was appointed the President of the Derbyshire Agricultural Society for the present year." Samuel Oldknow - Tom Oldham - Marple Local History Society - 1990. Oldknow 200 Bicentenary Festival Programme - 1990.